I clean residential windows for Wilmington North Carolina, Hampstead, Leland, and the surrounding area in Southeastern NC. Hi, I am Benjamin, window cleaning pro. 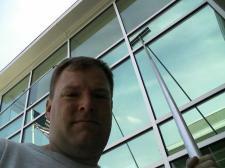 I have been cleaning windows around Wilmington NC since early 2002. I have over 20 years of professional cleaning experience. Many homes﻿ from Topsail to Southport and everything in between have benefited from my window washing talent. I am insured and I guarantee that you will be ecstatic with the quality of my window cleaning! Residential window cleaning prices in the right column are inclusive. Interior and exterior glass, tracks, and screens are included in the price, not as added charges. Others advertise a low price then add on fees for the extras. It is worth getting a quote from me! ﻿ Please call 910 685-1664 to set an appointment. Screens and tracks included! So count them up and call! * Price does not apply to older units with storm windows or windows with grids similar to French doors.